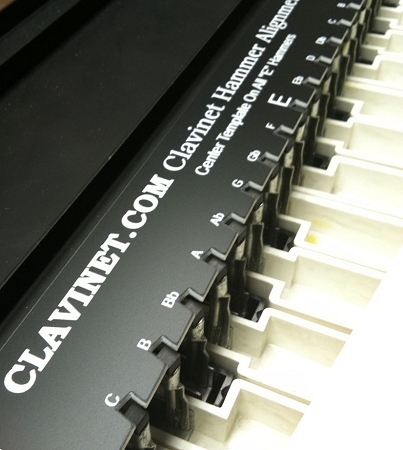 Save HOURS of frustration and quickly align your clavinet hammers with this nifty tool! Years of percussive striking causes hammer holders in a clavinet to bend out of place. Double notes, missed notes, and a variety of quirky, off-pitch sounds are usually caused by misaligned hammer holders. Until now, aligning hammer holders in a clavinet was a tedious process that usually involved a small mirror, a flashlight and lots of patience. Simply place the Clavinet.Com Hammer Alignment Template against the keybed frame, line up the "E" hammers, and align all of the hammer heads to their corresponding slots. Service techs as well as do-it-yourselfers will find this tool invaluable!